Star Time is a 1991 71-track, 4-CD box set by James Brown. Its contents span most of the length of his career up to the time of its release, starting in 1956 with his first hit record, "Please, Please, Please", and ending with "Unity, Pt. 1", his 1984 collaboration with Afrika Bambaataa. It includes a few previously unreleased tracks. 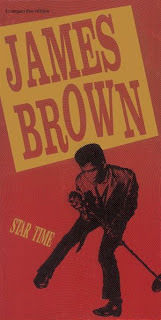 The box set's title comes from the question Brown's announcer would traditionally ask audiences at the start of Brown's concerts: "Are you ready for star time?" Star Time's liner notes, written by Cliff White, Harry Weinger, Nelson George, Alan M. Leeds and Brown himself, won a 1991 Grammy Award for Best Album Notes. The notes also include album and singles discographies and a one-page comic by Mary Fleener, a visual interpretation of the song "I Got You (I Feel Good)." In 2003, the album was ranked number 79 on Rolling Stone magazine's list of the 500 greatest albums of all time.